Promenade Limousine & Coachworks of Tampa Bay is pleased to offer a variety of corporate transportation packages, including limousine rentals, car service, Airport Limo Service, and more. Treat prospective clients to a night out in downtown Tampa or Clearwater Beach. Transport company employees to events at the Tampa Convention Center or to company retreats. We offer everything from stretch limos for formal events, to SUVs and luxury limo buses, our spectacular Fleet of Limousines can accommodate groups large and small. Have an important upcoming meeting? Each of our chauffeurs takes great pride in their punctuality, professional appearance, courteous demeanor, and in providing an enjoyable, safe experience for all passengers. Interested in weekend rentals and other packages for your company? Contact us for special corporate rates at (813) 223-1691 (Tampa) or (727) 898-6167 (St. Petersburg). 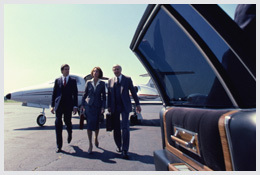 You can also book your limo rental online using our Free Online Reservation System.